The Trump administration has blocked the Navy and Pentagon from sending U.S. warships to China to take part in a People's Liberation Army (PLA) naval celebration, according to administration officials. The PLA invited the United States to dispatch warships and senior Navy officers to take part in the 70th anniversary of the founding of the Chinese Communist navy, a major Beijing propaganda event set for later this month. However, the State Department argued against any American participation in the April 23 event over concerns China plans to use the presence of U.S. warships to bolster its international standing. Instead, no ships or officers from the United States will take part. U.S. participation instead will be restricted to sending officials from the U.S. defense attaché office in Beijing. A Pentagon spokesman had no immediate comment. The rejection of the Chinese military invitation is a major snub and a clear sign that tougher policies toward China under President Trump include dialing back years of unfettered military-to-military engagement with the PLA. Pro-China officials for years have sought to "build trust" with PLA generals and admirals through frequent and often one-sided military-to-military exchanges. The program, however, has done little to alter China's aggressive military activities in places like the South China Sea and East China Sea. Nor have the exchanges improved Chinese military behavior. A Chinese destroyer nearly rammed the guided missile destroyer USS Decatur in the South China Sea on Sept. 30. In May, Chinese forces operating from a military base in Djibouti fired a laser at U.S. surveillance aircraft that damaged the eyes of American military air crews. Critics of the military exchanges with the Chinese military have said the interactions are unlikely to produce trust since the PLA is not a national army like the U.S. military. The PLA is under control of the Communist Party of China and its main task is keeping the party in power. Despite decades of conciliatory U.S. policies toward Beijing, China's military continues to view the U.S. military as an imperialist enemy engaged in conspiracies to contain China's overall modernization. The failure of the United States to take part in the Qingdao military event is expected to prompt regional American allies to cancel their plans to send naval forces. Japan and South Korea reportedly are planning to send ships. The refusal to take part in the PLA naval parade comes amid growing tensions between the United States and China. The administration currently is engaged in trade talks with China and is opposing Chinese military encroachment in the South China Sea. The PLA has deployed advanced anti-ship and anti-aircraft missiles on disputed islands in the Sea—despite a promise several years ago from Chinese leader Xi Jinping not to militarize the islands. China also is stepping up pressure on Taiwan. On Sunday, two Chinese J-11 warplanes crossed into Taiwanese airspace and over the informal line dividing the 100-mile Taiwan Strait in a show of force. The Chinese J-11 incursion followed the administration's decision to sell a new batch of F-16 jets to Taiwan, and also a recent U.S. warship transit through the Strait. White House National Security Adviser John Bolton criticized the Chinese J-11 incursion on Twitter. "Chinese military provocations won’t win any hearts or minds in Taiwan, but they will strengthen the resolve of people everywhere who value democracy," Bolton tweeted on Monday. "The Taiwan Relations Act and our commitment are clear." The 1979 law states that the United States will defend Taiwan from a mainland attack. China also is pressuring Japan over the uninhabited Senkaku Islands in the East China Sea that are Japanese territory but which Beijing is claiming as its land. On March 30, Japanese interceptors tracked four Chinese H-6 bombers near Okinawa. Senate Armed Services Committee Chairman Jim Inhofe (R-Okla.) praised the decision. "America's ships and sailors are needed across the Indo-Pacific," he told the Free Beacon. "America's Navy is busy enough confronting the challenges posed by China’s aggression in the South China Sea and other critical aspects of great power competition without the distraction of participating in communist pageantry." Retired Navy Capt. Jim Fanell, a former Pacific Fleet intelligence director, said the cancelling of U.S. participation in the PLA navy anniversary is a positive sign. "It is reassuring to see the U.S. administration sustain its previous decisions by not sending any Navy warships to participate in the PLA navy's 70th anniversary international fleet review in Qingdao," Fanell said. "Not only would the presence of Navy warships legitimize the PLA navy's bad behavior at sea, it would also undercut the 2018 decision to disinvite the PLAN from the Rim of the Pacific Exercise." The Pentagon announced in May it was disinviting the PLA from taking part in the world's largest naval exercise called Rim of the Pacific, or RIMPAC. The announcement specifically mentioned Chinese militarization of islands in the South China Sea as a reason for the cancellation. A month earlier, the first advanced anti-ship and anti-aircraft missiles were deployed in the Spratlys. Washington clearly is telling Beijing "we are serious about not accepting the PLA navy's bullying, as well as reminding our allies that our commitments are not just words alone," he added. Rick Fisher, a China expert at the International Assessment and Strategy Center said China likely would have canceled its invitation after the expected announcement of the sale of 66 F-16s to Taiwan is announced. An announcement is expected in the coming days. "Bravo for the administration," Fisher said. "It is long overdue that the U.S. cease policies that prize ‘engagement' of the PLA over defense of American interests." Fisher also stated: "The Chinese Communist Party is the greatest murder machine in human history and is now gathering an existential threat to the United States and all free societies. There should be no American gesture to celebrate its 70th Anniversary." Randall Schriver, assistant defense secretary for Indo-Pacific security affairs, told a House hearing last week that China is undermining the international order. "China continues to militarize disputed features in the South China Sea and has also delivered coastal defense cruise missiles (CDCM) and long-range surface to air missile to Spratly Islands outposts, a clear sign that its intentions are not benign," Schriver said in testimony to the House Armed Services Committee. "This marks the most capable land-based weapon system yet deployed by China in the disputed Spratly Islands." Schriver said tensions with China do not mean an end of military exchanges. "As we compete with China, we will continue to maintain military-to-military contacts aimed at reducing risk and pushing for China’s compliance with international rules and norms," he said. Adm. Philip Davidson, commander of the Indo-Pacific Command, called China the greatest long-term strategic threat to a free and open region. "Through fear and economic pressure, Beijing is working to expand its form of communist-socialist ideology in order to bend, break, and replace the existing rules-based international order," Davidson said at the same hearing March 27. "In its place, Beijing seeks to create a new international order led by China and with ‘Chinese characteristics'—an outcome that displaces the stability and peace of the Indo-Pacific that has endured for over 70 years." China announced last week a "naval parade" of international warships will be held at the Qingdao celebration. PLA Sr. Col. Wu Qian announced March 28 that the international naval parade was approved by the Communist Party's Central Military Commission. "The activities will include a high-level seminar, an international fleet review, military tattoo performances, and cultural and sports activities," Wu said. "Up till now, over 60 countries have confirmed to send navy delegations to participate in the activities and multiple countries have confirmed to send naval vessels to the international fleet review." France is expected to dispatch its flagship Charles de Gaulle warship and Russia may send its aircraft carrier Admiral Kuznetsov, according to Chinese news reports. "The naval parade will give the PLA navy an opportunity to polish its image as a friendly and peace-loving modern military, and President Xi Jinping, who is the chairman of the Central Military Commission, is expected to preside over the parade," a Chinese source told the South China Morning Post. 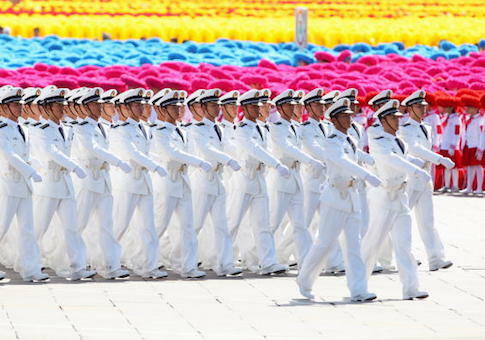 In addition to the naval parade, the PLA is planning a major military parade in Beijing on Oct. 1, the anniversary of the founding of Communist China. China's two aircraft carriers, the Russian-built Liaoning and a second indigenous carrier are expected to take part. China also is expected to showcase its new nuclear powered ballistic missile submarines at the April 23 naval parade in the Yellow Sea near Qingdao. The Chinese Defense Ministry has said that more than a dozen nations were invited to send forces to take part in the naval parade.